For the ambitious climbing enthusiast who’s ready to take on some of the best cycling terrain in the world, SpiceRoads presents: Taiwan Traverse. Over 900 kilometers of spectacular winding roads, extreme grades, 10,000 meters of climbing, and exciting descents make this a dream trip for cyclists up for the challenge. Known for its hyper-modern coastal cities, the interior of the island of Taiwan is an assemblage of peaks. Two mountain ranges predominantly cover most of the island’s geography, the Central and Eastern Mountain Range, and you’ll traverse both of them on this challenging road cycling tour of Taiwan. Beginning outside of Taipei, gear up for the real ride, with 4 of the tour’s most demanding days coming in quick succession. You’ll tackle peaks and passes, and test your legs on nearly 8,000 meters in this stage as you climb through the Central Mountain Range. The environment is raw and pristine, mostly populated by Taiwan’s aborigines, and we’ll make the most of the humble accommodations available in this remote region. But the best is yet to come. Day 4 culminates in a 60 kilometer descent through Taroko Gorge in the East Rift, a highlight of any trip to Taiwan and special experience to ride through it on two wheels. A rest day exploring Taroko National Park gives the legs a chance to recover, before heading southbound along the coast and through the foothills, on a route lined with natural hot spring resorts- sure to become an integral part of your evening routine! Over the course of five days, you’ll make your way down the east coast of the island to the Kenting Peninsula and the southernmost point of Taiwan, now having navigated almost the entire length of the island. A final ride into the mountains again, into the aboriginal settlement of Wutai, bids the mountains goodbye as you head for Taiwan’s second city of Kaohsiung for departure. Incredible and diverse scenery, welcoming local culture, and unparalleled cycling on fabulous roads with minimal traffic set the stage for one of the most challenging rides your legs are sure to remember for a long time to come! From the hotel, we drive to Fusing to start our ride. At 350 m in pine country, we climb gently and top off at 1,240 m, but it won't be strenuous. We ride from the hotel to our ascent of the Central Cross Island Link, taking us to just under 2000 m and the high-altitude Wuling Plateau. The scenery is spectacular up here, and the air fresh. We continue up to Li Shan, and after 25 km, we are at the highest point, just above 2,000 m. We then descend into one of the most remote parts of the island, a highlight of the trip! We tackle the highest road in East Asia at 3,275 m. Start with a 32 km climb up 2,175 m, then there's an exhilarating ride down some 3270 m into Taroko National Park and the world famous Taroko Gorge. 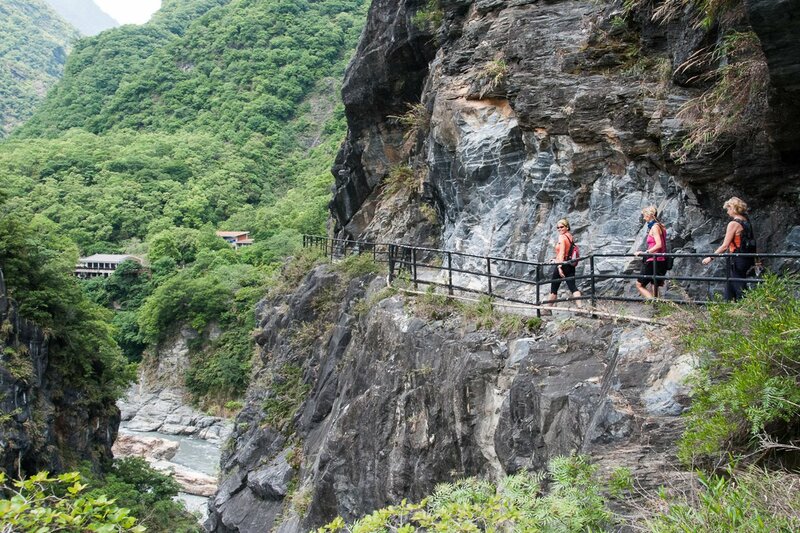 Take a break off the bikes by hiking in Taroko Gorge. We visit Siangde Temple and a pagoda with valley views from the top and walk the Tunnel of Nine Turns trail. Ride out of Taroko Gorge to the east coast and into the East Rift Valley. The undulating route hugs the foothills and takes us through numerous aboriginal villages to a hot spring. We head south and then up into the Badlands. We take backroads to the lush Jhihben River Valley, where the hot springs are between 75-96 degrees Celsius. We ride over Capricorn Pass and down to the white sand beaches of Kenting, then to the southern-most point of Taiwan for a photo op. We explore the southern part of Taiwan, which has a dramatic coast line and the best beaches on the island. Our last ride of the tour to our last hot spring of the tour. The ride starts off along the coast, then turns inland as we cycle along the banks of the Lao Nong River for a soak in the hot springs. A morning transfer to catch a flight or the high-speed train to Taipei or to your Kaoshiung hotel. Day 1 - Taipei - Fusing Ride 50km. +514m / -185m. Very challenging but beautiful country to bicycle and hike in. The Taiwanese people are quite friendly! Taiwan is an excellent cycling destination which may be unfamiliar to many. The SpiceRoads team provided fantastic organisation leaving us free to enjoy the beautiful mountains, friendly people, and great food. The climb over the Wuling pass and down the Gorge is among the top cycling experience. The guides know exactly what makes the perfect cycling trip for cyclists. On this mountainous, and in places steep, ride, you and your legs will be put to the test as you head up and over the challenging passes of Taiwan's mountain ranges. You will ride just under 915 km in 9 days of riding on smooth tarmac roads. The trip is fully supported, and your guide’s expert knowledge of the area and terrain means that you always know what is coming up in terms of distance and difficulty. This makes a tremendous difference, as does the constant supply of cold drinks, ice, and fresh fruit. Suitability: This is a tour for cyclists possessing a high level of physical fitness. Riders should be capable of making sustained climbs, and riding over 100 kilometers per day through mountainous terrain. Fitness will be a huge asset on those long days, steep climbs, and undulating hills, as will cycling skill to handle long descents. The tour is fully supported, and the bus is always close at hand for those that find the riding too difficult. Biking Conditions: This is a climber's dream tour. A total of over 10,000 m climbing in 10 cycling days, the true test is within the first four days of the route, which are the most climbing intensive days and total over 8,000 meters elevation gained in less than 400 kilometers. Despite the climbs, the route is on good quality tarmac roads through the mountains and along the coast. We pick you up from your Taipei hotel in the morning and drive outside the busy city to start our ride to Fusing. We will just have a short ride, but it will start at sea level and end at about 450 m. It will be a gentle start through undulating hills to get the legs warmed up before we start the serious climbing. You'll be riding through thick forest, and the thick moss and huge ferns that line the narrow road give the whole place a Jurassic aura. The second day, and first big climbing day begins from the hotel. 35 undulating kilometers warm up to one of the first steep sections and the first peak of the day at 60 kilometers. You’ll make a sharp descent down to the base of the plateau before the long climb begins to the top of Wuling Pass, nearly 2,000 meters above sea level. Admire the dense forest, changing from cedar to bamboo along the way, and breathe in the fresh air- you’re going to need it! We start the day by continuing up the north cross island highway to Lu Shan, a town famous for its mountain fruit. After 25 km, the long climb begins as we make our way to the day’s peak, at over 3,000 meters in one of the most remote areas of the island. Following our climb, we have a long descent through the remote farms in the high mountains. One of the highlights of the trip, the climb starts immediately, and you’ll make an early start to ride the 32 kilometers and 2,175 meters up to Hehuanshan Pass, the highest road in East Asia at 3,275 m. A car transport and options to start at different points along the way on the way up are available. Once at the top, the rewards come one after the other: cold drinks and snacks, fabulous scenery for memorable photos, and an exhilarating ride down into Taroko National Park and the world-famous Taroko Gorge. This will be one ride you will never forget as we drop some 3,270 m, riding through endless tunnels and a multitude of eco zones. The last 20 km of Taroko Gorge is a mind-blowing ride through marbled walled passageways that twist and turn as the gorge rises some 500-1,100 m above! We take a break from the bikes and spend the day hiking in Taroko Gorge. We will visit Siangde Temple that has a giant statue of Guanyin and a pagoda that provides views of the valley from the top and walk the Tunnel of Nine Turns trail, which is on the original road through the narrowest part of the gorge. There are many other hikes to choose from, and we'll decide which ones are best to do based on the group's interests. From Taroko Gorge, we ride out onto the east coast and into the superb East Rift Valley. We cycle on an undulating route that hugs the foothills and takes us through numerous aboriginal villages. After cycling through this fer-tile valley, we overnight at yet another wonderful hot spring resort! We ride from our hotel south and then up into the Badlands area and enjoy splendid views from our deserted mountain road. We eventually connect with the Luye backroads and enjoy a wonderful ride through the outskirts of the port town of Taitung and down to the lush Jhihben River Valley, where the hot springs are between 75-96 degrees Celsius. Today's ride takes us over the top of Capricorn Pass and down to the white sand beaches of Kenting. Starting with a 50-km ride down the south-east coast, we make our first crossing of the island from east to west. This is the route taken by most riders travelling around the island. As we ride over the southern mountains, we descend down to the west coast and around the Kenting peninsula. We stop for a photo op at the southernmost point of Taiwan. Starting early in the morning from our guest house, we explore the southern part of Taiwan, which has the most dramatic coast line. We'll be hugging the coast and seeing the island’s best beaches. After lunch, we start climbing into the mountains to the village of Wu Tai, famous for its stone house architecture. On the road up to the village, we cross the highest bridge in Taiwan, approximately 100 m above the river. It's a 20-km climbing road, but the ascent is gradual up to Wu Tai, an aboriginal village. A short walking tour around the village in the afternoon finishes the day. On the last ride of the tour, we leave behind our mountain village and head towards the vibrant southern city of Kaohsiung. 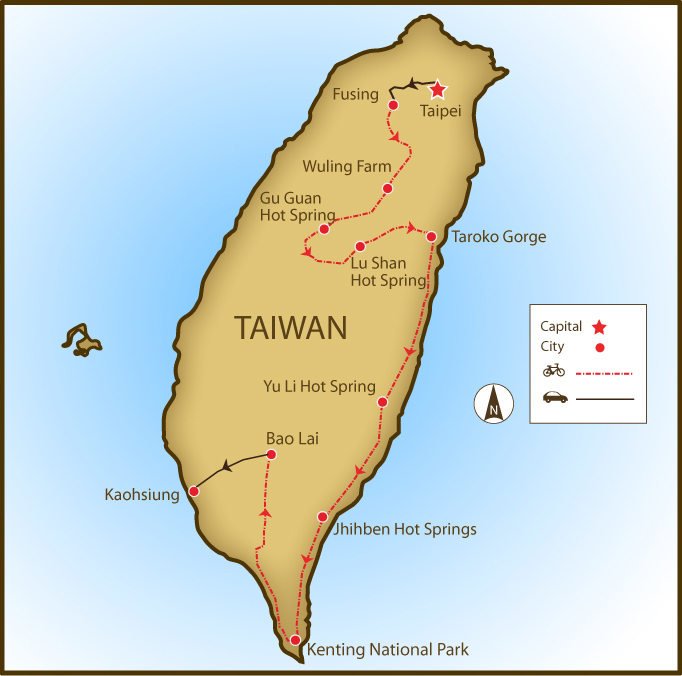 We’ll lose elevation, cruising downward out of the peaks that have defined our journey through Taiwan. Fertile farmland lines the mountainous slopes along our ride, and we’ll stop for lunch in on one of the many indigenous villages for some traditional aborigine food. Only a few small climbs remain, until we reach the Kaoping River on the very outer limits of Kaohsiung city. The day doesn’t end here however, we have one more surprise in store, the fantastic Fo Guang Shan Monastery. Multi-level pagodas and endless gilded Buddha statues line the pathways of this incredible Buddhist establishment. Following a wide-eyed wander through the monastery, we’ll transfer to our hotel in the city for the evening, with plenty of time to disassemble bikes, pack, and rest up for the next day of onward travel. We'll have one group transfer to Kaohsiung where you can catch a flight or the high-speed train (highly recommended!) to Taipei or to your Kaoshiung hotel if you wish to spend the night in this port city. We have a limited number of road bikes available for rent if you choose not to bring your own bicycle. The cost to rent a road bike for this tour is listed in the tour pricing section. If you have your own saddle that you are comfortable with, you are welcome to bring it, and we'll fit it. We can provide strap-style toe cages if requested, but you might like to consider bringing SPD clip pedals if you use them, and please bring your shoes and cleats. If you bring your own bike, please make sure it is a road bike in good mechanical order. All nationalities require a passport for entry into Taiwan. Please ensure your passport is valid for at least 6 months from date of entry. If staying less than 30 days then a visa is not required for European, North American, Australian and many other nationalities.